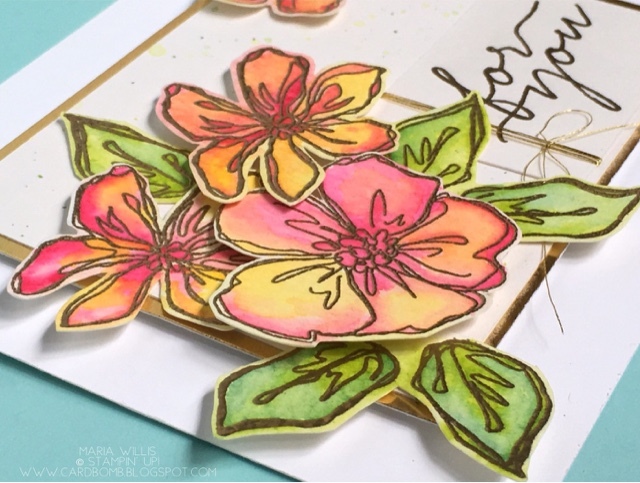 Hey Everybody and welcome to this month's One Stamp At a Time Blog Hop! I have so much exciting news to share with you but today I'm going to have to keep my post short because I've got a wicked cold and I am fading fast! 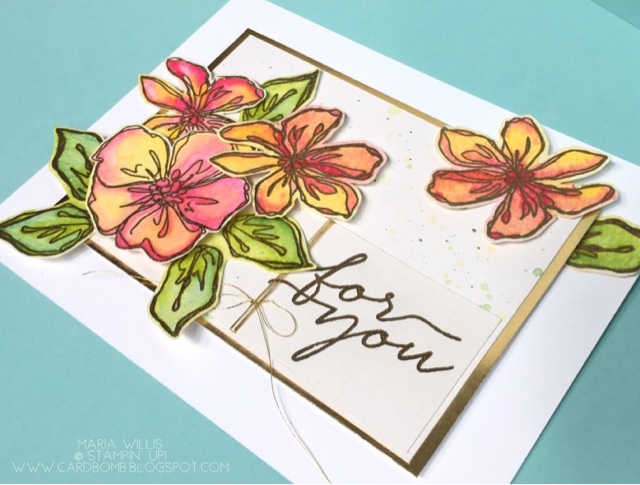 This month's theme is Flower Power and luckily I had just the right card to share with you. I shared it for the first time this past weekend on my display board at the Stampin' Up! OnStage event in San Diego (more on that in a future post when I have the energy to share it all). Here it is... As a first time display stamper I was so nervous that I wouldn't have created enough samples or that my samples wouldn't be "good enough." I was supposed to go straight from the airport to set up my display and wouldn't you know it... my flight was delayed! When we deboarded the plane I hopped in Uber (just kidding, my friend Adrienne and I walked down the strip, back into a building, up some escalators, and walked across the "Sky Bridge" to the parking lots where Uber is allowed to pick you up, and then I finally saw my ride driving by). I arrived at the Convention Center and was so relieved when they let me in even though I was so late. I was excited, anxious and nervous and was trying to figure out the best way to set up when Patty Bennet showed up to take pictures of the display boards. I'm a huge fan of Patty's. 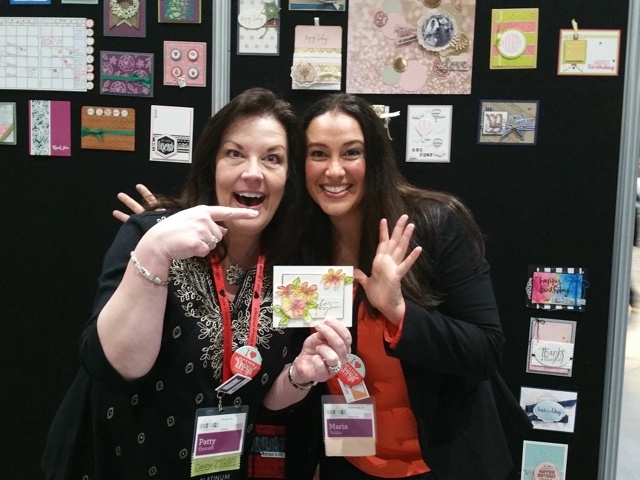 If you don't know who she is one of Stampin' Up's! top demonstrators... more importantly, she's a kind and gracious person who always seems to be willing to help others. Side note: Patty celebrated $1.2 Million in sales this past weekend and launched the stamp set that she designed for being a million dollar seller (it will be available to non-demonstrators starting in June). Her set is called Ribbon of Courage and it was created in honor of her mother who lost her battle to cancer eleven years ago. Her presentation was touching and she was quick to point out that this set can be stamped in any color in honor of whatever kind of cancer you'd like it to represent. It can also be stamped in yellow in honor of our troops. Seriously, this is one of the most meaningful sets I've ever laid eyes on. I'm lucky enough to have it in my hot, little hands already so be on the lookout for it! 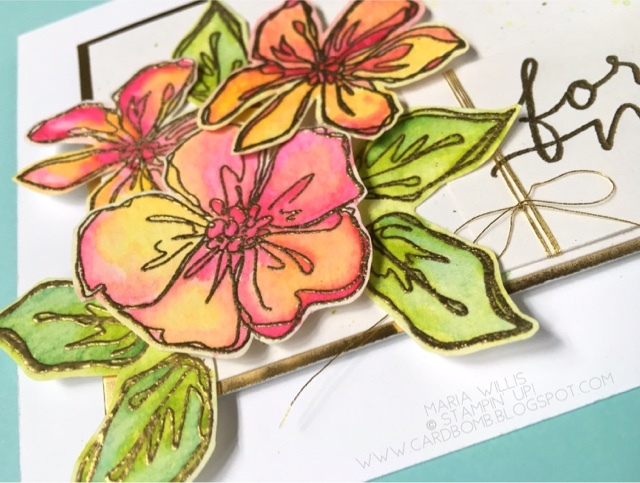 I heat embossed the flowers from Penned & Painted in gold and then watercolored them with only two colors: Daffodil Delight and Melon Mambo. I love the way they blended into peaches and oranges. Yes, there is a special technique to make this happen. I am hoping to do a video soon to show you how since describing it would be difficult. Did you notice the colors on the leaves? I used two of the new In Colors that will be released in June: Lemon Lime Twist and Tranquil Tide. I was really happy with the way these new colors blended together. I had a little trouble getting a good shot from the front but here it is. I fussy cut the flowers and leaves and layered them over a splattered background, matted on gold foil. Here's a picture of Patty and me with my card. Just in case you're interested in making a card like this one, these beautiful flowers (Penned & Painted) are retiring if you can believe it! So sad. If you want them you had better grab them now! Feel free to shop with me (link below blog roll) and ask me any questions that you might have. Now you are of to see the amazing creations of Marisa Gunn! Love how the touches of gold add a bit of elegance to the card - GORGEOUS! Seriously the most gorgeous card EVER!!!! :) It was wonderful to meet you and thank you for your kind words in your post1!! So wonderful to meet you too Patty! Your kind words have really meant so much to me. Beautiful card (but yours always are)! your card is gorgeous ... isnt Patty the sweetest person ever?? well after us two of course ;) I know when I extended my trip after the 2013 IT in Utah and I asked her what places/things we could do in San Francisco and she's like 'do you mind if we come in and share the afternoon with you?' mind? let me just pick myself up off the floor! Thanks Leonie! Uh, yes! Patty is amazing! She's such a superstar but is humble and kind! Lucky you to spend the afternoon with her! Of course, I'd love to spend an afternoon with you too! Gorgeous! 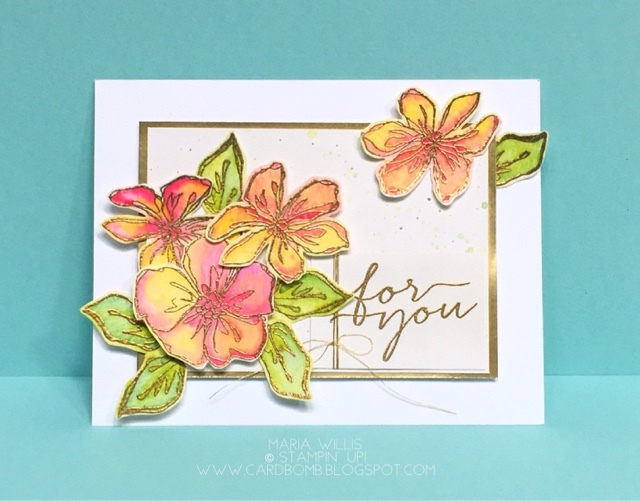 The gold embossing mixed with the watercolor (which happens to be my favorite) certainly cranks it up a notch! The colors are beautiful!